Those of you familiar with us know that we here at Pingdom provide an uptime monitoring service that allows its users the ability to monitor the uptime (availability) of their websites and servers from the Internet. This way, if there is a problem, they will be alerted right away. Normally our users access their data via an online control panel, but we also have an API that the more technically inclined can use to access their data. One of the companies that use Pingdom is Camvine, a company with a product called CODA that allows you to display information on remote displays, all managed via a central website. Whether you’re a large or small organisation, there’s probably some computers somewhere that you rely on being available all the time, and need to know quickly when they’re not. Systems exist out there to tell specific people when machines are upset, but it helps to have this information generally available to people in your organisation, not just when they’re at a computer. To solve this, you can use CODA to keep everyone in the company up-to-date with the health your server infrastructure at a glance. 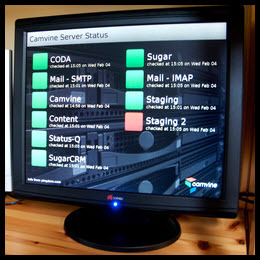 Here at Camvine we need to know the status of our web server that our customers use, but there’s also a suite of servers (mail server, our test servers, etc.) that are vital to the smooth running of Camvine. To make sure we keep on top of all this we make use the Pingdom monitoring system. Pingdom will not only email a set of people when servers fail, but it has an API that lets you query the information programmatically – and we use this to ensure our tech team, via CODA, can always see what’s going on. Very nifty indeed! We have seen some creative ways how companies have made use of our API to combine Pingdom monitoring with their own internal services, but this is one of the nicest yet (and certainly very useful and visually pleasing). You can find more information and source code on their website.